The 2017 Toyota Tacoma is one of what is now a growing number of mid-size trucks aimed at those of us who don’t need the size and capability of a traditional full-size offering but still want the versatility and flexibility a pickup offers. This year sees the addition of a TRD Pro trim level, which therefore delivers even more off-road capability than before. It's just another reason why checking one out at Pedersen Toyota could have you thinking about the fun you could have exploring the off-road trails close to the dealership in Fort Collins, CO.
Last year saw the Tacoma undergo something of a redesign, although its size and configuration remained largely the same. It was already a great-looking mid-size pickup, but it's now even more stylish and it's hard to see too many buyers not being attracted by that styling. Of course, the styling isn't the most important attribute when you're heading off with friends and family for outdoor adventures, but there's no harm looking good while you’re enjoying yourself. Colorado has some of the most amazing natural scenery it's possible to imagine, and getting out there to make the most of it is a lot easier if you have a 2017 Toyota Tacoma. Old Flowers Road is a perfect example of an excellent trail for someone to take on in a Tacoma, especially if they're new to the world of off-roading. It's a 22-mile trail that's easy to navigate, although it can become muddy and slippery during a wet season. Along the trail there are beautiful views of meadows, forests and abandoned cabins, but you can get closer to everything by using your Tacoma to bring a few toys with you. The rugged truck bed can handle anything you throw at it, so it's perfect for transporting things like mountain bikes, for example. The bed features a locking tailgate and a standard deck rail system, which features C-channel frames and four heavy-duty adjustable tie-down cleats for keeping things secure. And if ATVs are you're thing, the Tacoma is the perfect vehicle for towing one to the edge of the wilderness on a trailer. If you fancy a trail that's a bit more challenging and is therefore described as "moderate" in terms of the off-road driving skill-level required, you might want to check out Storm Mountain Trail. This one is a five-mile round trip that takes around two hours to navigate, and it's conveniently located close to Estes Park and Loveland off Highway 34. It covers a wide variety of different terrains that beginners and seasoned off-road enthusiasts can enjoy, so an entry level Tacoma SR will be more than up to the job as long as it's been specified with the available 4WDemand part-time four-wheel drive system. But if you really want to test the off-road capability of you and your 2017 Toyota Tacoma, Kelly Flats located immediately off Highway 14 in Poudre Canyon is where you want to be. The perfect vehicle for negotiating this 21-mile round trip is the new 2017 Toyota Tacoma TRD Pro. Although the majority of the trail is considered fairly easy, keen off-roaders know it best for "Heart Attack Hill", which is a very steep, difficult and rocky climb near close to the start. The TRD Pro will help you out with its 3.5-liter V-6, standard four-wheel drive, automatic limited-slip differential and hill-start assist control. That's not all though, as it also includes: TRD-tuned off-road suspension, front coil springs and rear leaf springs; electronically controlled locking rear differential; Multi-Terrain Select and Crawl Control and Active Traction Control. Of course, you don’t have to be an off-road enthusiast to enjoy the benefits of the 2017 Toyota Tacoma. 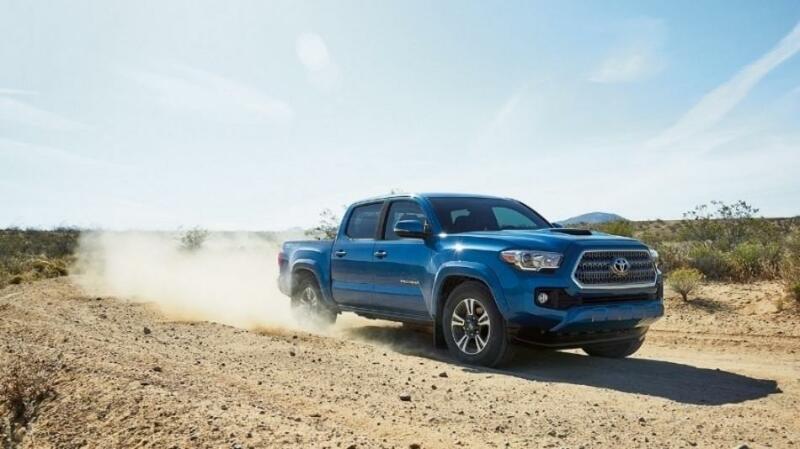 With models starting from $24,320, there's a Tacoma to suit all types of buyer, need and application, so make sure you check them out at Pedersen Toyota.